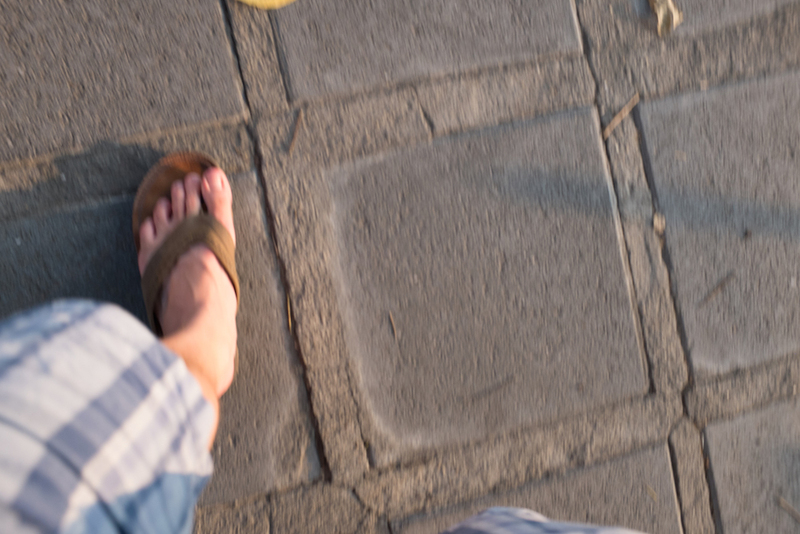 Every time I go out taking photos in Bangkok, I end up with the same 11 photos, no matter where I go or what I see. Allow me to explain. This should not be confused with street photography. This is an accidental photo of the street that I inevitably take every time. 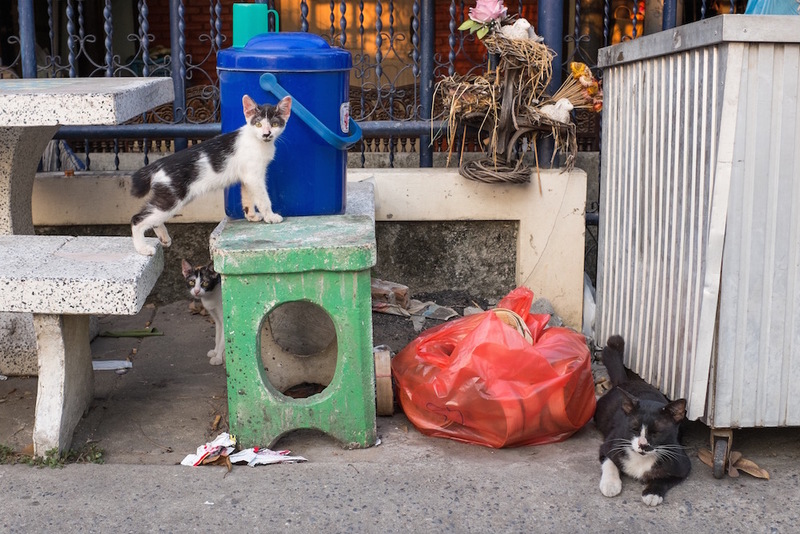 I make a lot of cat friends when I walk around Bangkok, and many of them like to pose for photos. They are always rewarded with chin-scratches or tummy-rubs for their effort. There is always a scene that I just can’t catch. A real street photographer would have no trouble getting the shot, but for whatever reason the stars, or people, don’t align for me. In the photo above, the school uniforms matched the taxi perfectly, but the kids and the car started to move away before I could get there. Fail. I always encounter locals who strike a pose which ruins my candid photo attempts. 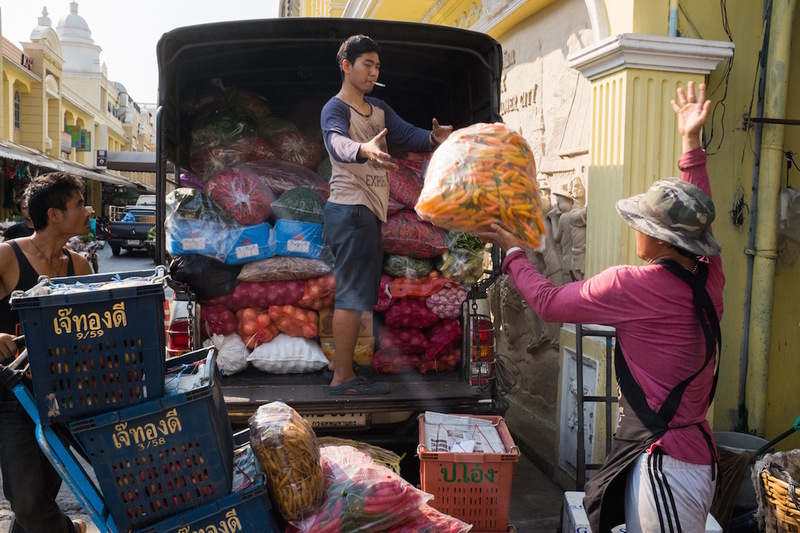 Thai people are always messing up my shots. They are so inconsiderate. When going through my shots, I always see at least one person who is wondering what the heck I’m shooting, or why I am taking their photo. I have a problem. 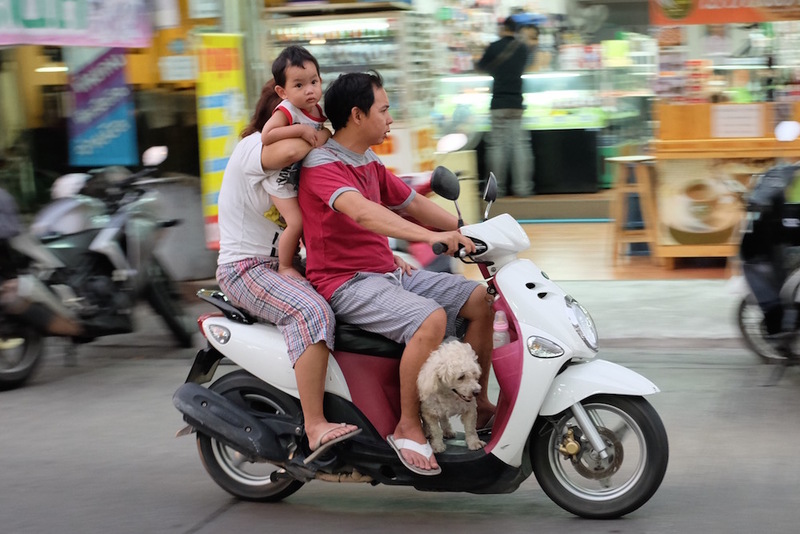 Anytime a scooter laden with a family drives by, especially if the family dog is also a passenger, I react like it is the first time I’ve seen such a thing and fire off photos like a crazy person. I can’t help myself! 7. The WTF Was I Thinking? When I download my photos there is at least one that I have no idea what I was going for. I guess it seemed like a good idea at the time. Note: most of my readers have this feeling with all my photos. For someone who has never actually taken a traditional selfie, I take a lot of selfies. When reviewing my shots, there is always one (if not most all of them) where I see my mistake and wish I’d have moved a few feet to the side or waited just a bit longer. These failed shots are usually a result of me lacking patience. Of course, If I had a time machine I should go back about 65 years to encourage Donald Trump’s parents to pay more attention to him. If I could go back in time, I’d move to the right and get up on my tippy-toes to get the fish in foreground with the cats “looking” at them. As is, this photo is a failure. The Thai capital is an odd place. In the last week I have seen a monk walking the streets collecting alms with his pig, an E.T. 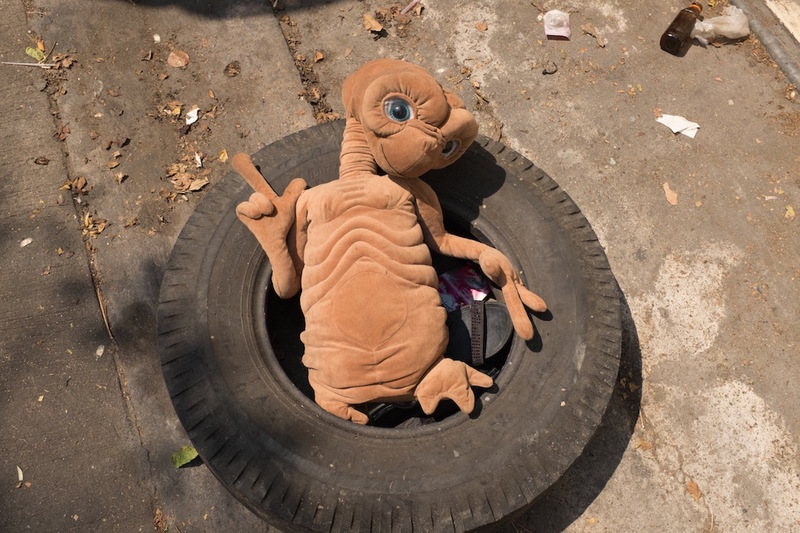 doll in a tire on the side of a road, and a tourist walking down Khao San Road in his underwear. I love this city. I always end up with one photo I like. This keeps me coming back! Do you see the same things when you explore in your area? I am glad that I’m not alone. By the way, what is #wirsindtraumfaenger? It is difficult to shoot or post every day for sure. I think with photography they key is to take you camera everywhere. I saw something really great at the dentist office today. Ha! This reminds me so much of when I would go off on photo sessions in Hanoi. I still have four years worth of photos to sort out and I almost feel I need a serious album plus a quirky one of all the crazy stuff I saw…. I can only imagine! 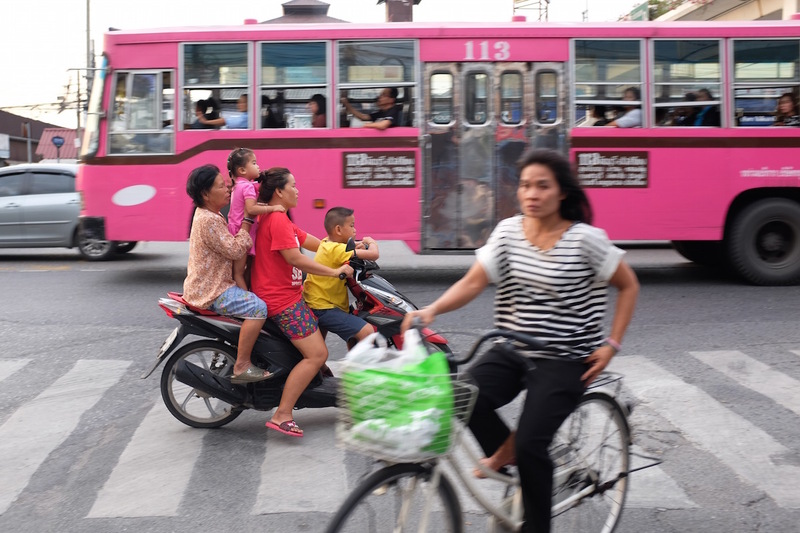 I see crazy things in Bangkok, but I think Hanoi is even worse, especially all the crazy things on the back of bikes. Four years of photos? You need to get started on that! I loved your list and I could relate to most of them – failed opportunities, accidental street shots, unintended selfies, WTF?, …. yup, I have them all on a regular basis. The difference is, even the shots you consider ‘failures’, I consider interesting – and in focus – which is more than I can say about mine. There is a major road near where we live that is a divided highway. Turnarounds are few and far between, so people will often drive the wrong way down the road. When I see families going the wrong way with kids standing up that really messes with my head! Thai people are the worst. … that they’re driving down the wrong side of the road?!! I too have most of those categories (except kitties). Most of my ‘street’ and ‘selfie’ come from when I put the camera on the seat next to me. I have more shots of the floorboards of the Jeep than I’d like to admit. I actually like your example of WTF. 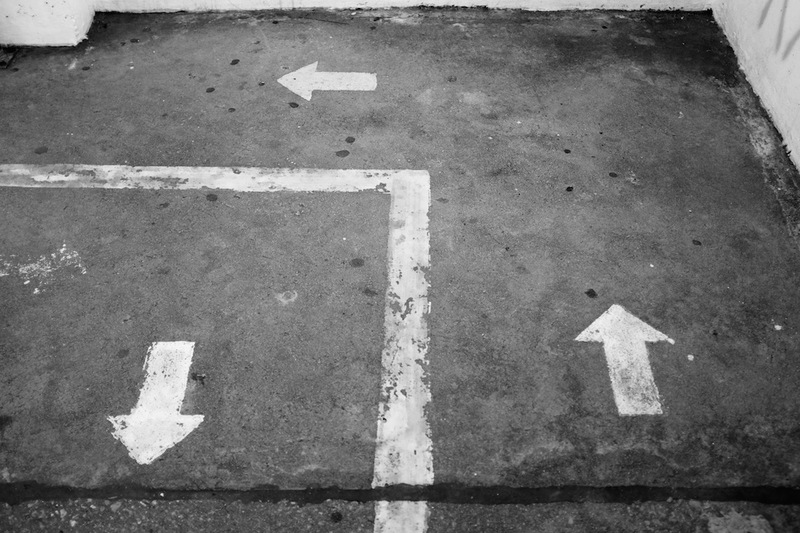 I makes me ask WhyTF did they paint arrows on the ground like that. I know most of these photos so well! The family on a scooter! The WTF! The weird stuff of whatever city I happen to be in! The fail due to lack of patience! The fail due to not being quick enough! The fail due to not seeing the optimal angle in the moment! And so it goes. Great post Jeff. And your winner is definitely a winner! Thank you Alison. Things move so quickly in cities! I find landscapes much easier! I am glad you have the same photos too. 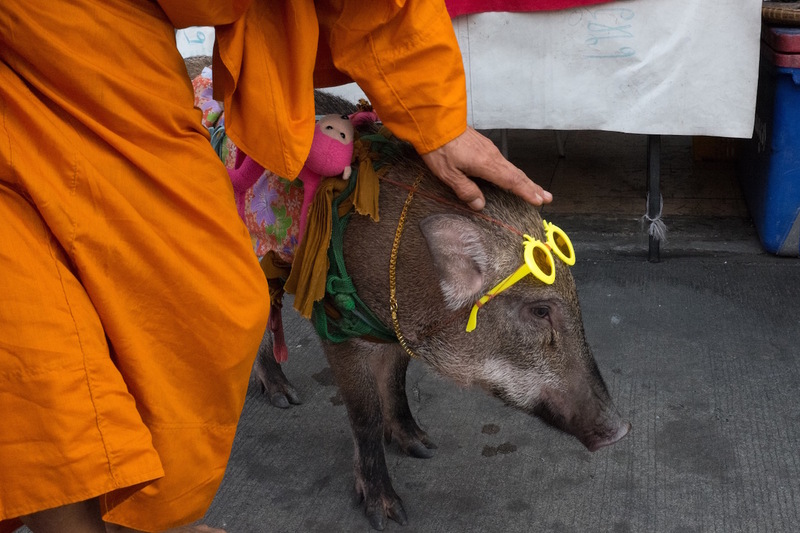 I absolutely adore the monk walking the streets collecting alms with his pig (who also has sunglasses and a doll strapped to its back … speaking of WTF!) and the gorgeous local girl. The monk was so unusual even the locals were snapping photos of him, so that was a bit comforting. I don’t know if I could have handled any more weirdness that day. I usually shoot the street when I’m trying to pre-focus. Thank you Sue. I’ll get in my time machine and go back to that moment. I think I hurried too much in part because all the locals were laughing and the lady was oblivious. I saw the pig about 10 minutes later. It was a good morning. 1. I was half-expecting to see smeared poop on your sandal or foot. 4. I had the same problem both problems in Taiwan – they all wanted to make goofy faces when I just wanted an unposed photo. 7. HAHAHA! I love when I see a scene and think “ooh, this will be a nice artistic shot” only to later wonder what the hell I was thinking. I’m still jealous that you get to be so blase about all these photo opportunities. 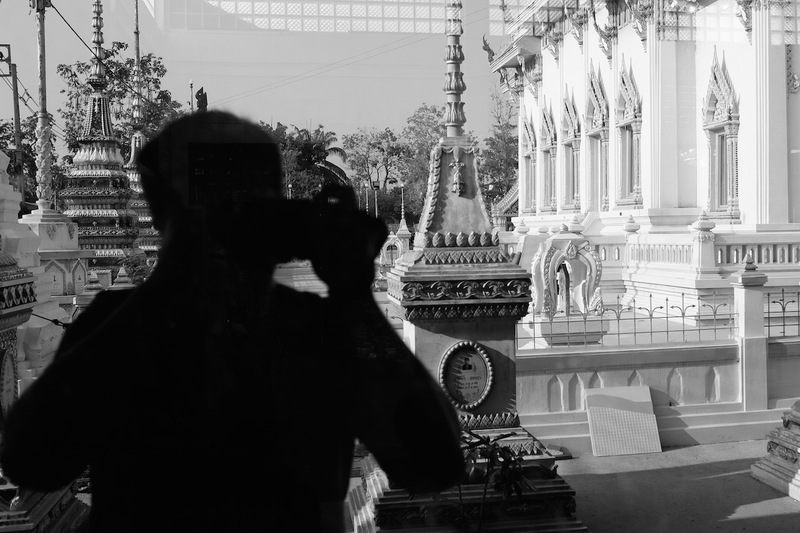 It is nice to get to shoot in Bangkok, I have to admit. March and April are the really, really, REALLY hot months, so shooting in the streets is a sweaty activity, but otherwise I do love it. The goofy faces kill me, although it does relax me and know that people in general really don’t care or enjoy being photographed here. LOVE your photos .. and the comments are Great!!!! I can now tell my friends what Bangkok really looks like! I live in Taiwan and the photo of the family on the scooter made me laugh so much. It’s the same here!! 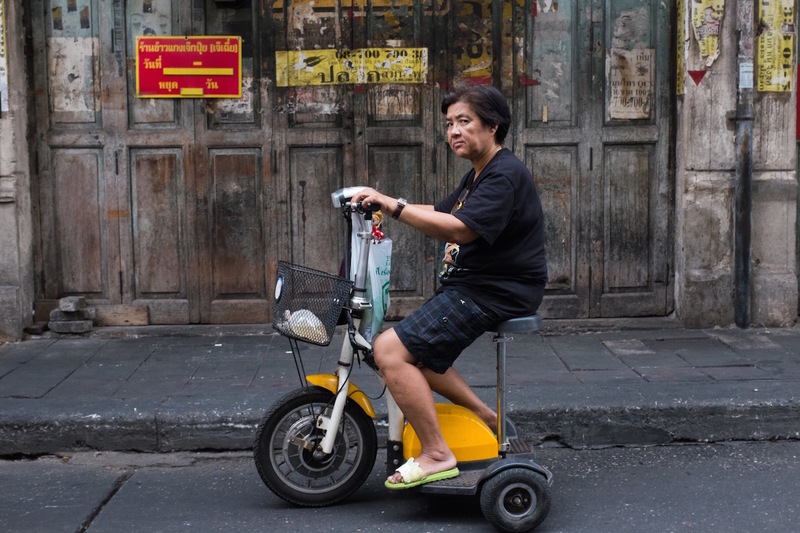 I love Asia for the scooters and all the crazy things that happen on them. Thanks for sharing. Great photos and great sense of humor: a pleasure reading your posts! Haha this is great and I definitely can relate to many of these frustrations such as the pink taxi…seeing it and missing it…the sideways looks,…the foot shot. 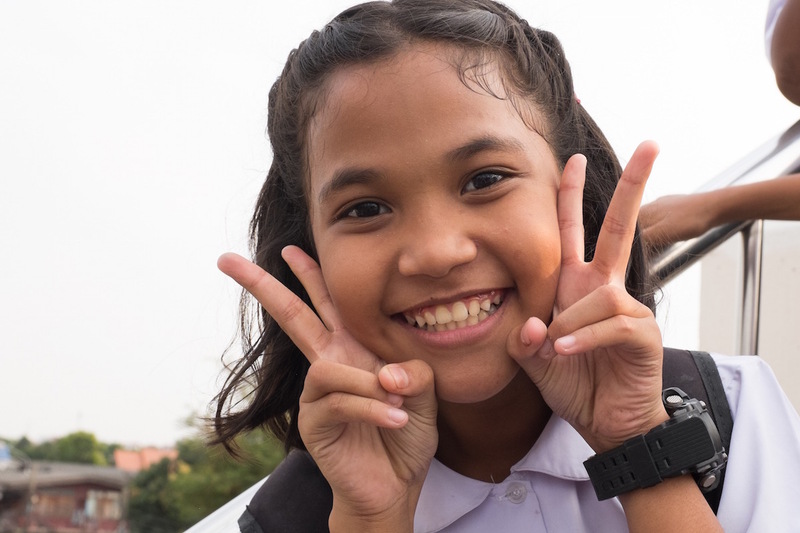 However, I do love that local posing shot of the girl. As well, the monk and his pig ~ terrific shot! Thank you Peta. It makes me feel good that so many of you can relate! Not really fails, except that I have a whole computer full of family on bike photos! The pig was unique though – saw that first thing in the morning and it made the rest of the day better somehow. Thank you for commenting. Haha, these are great. I always have an overabundance of cat , and side-eye shots (I like that term). 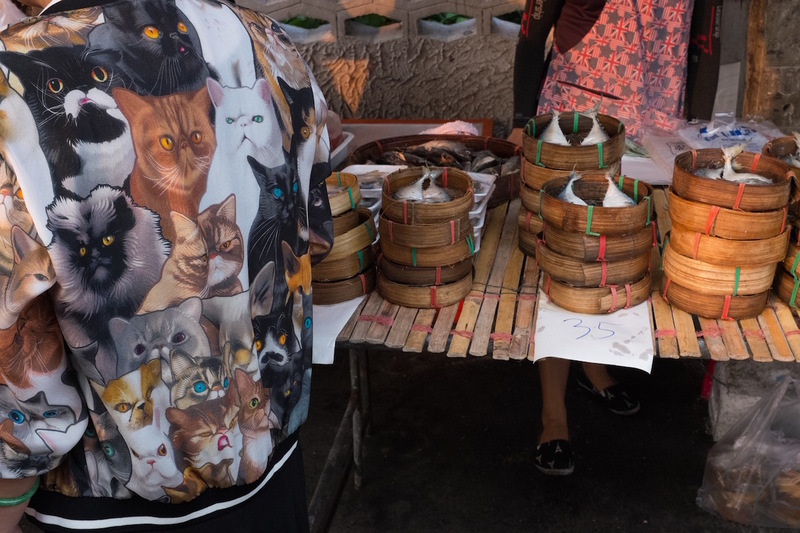 On our recent SE Asia trip I have an embarrassing number of failed crowded market shots and way to many saffron robe-clad monk photos (a big novelty for someone from dreary, everyone wears black and grey Vancouver). Thank you for sharing the link. Nice photos. Hysterical, Jeff! 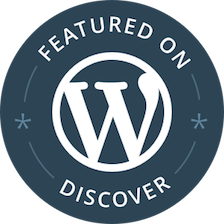 You always have such a wonderful and creative way of sharing your work. Your humor (and your great photos!) is what always makes me come back for more! Ah, thank you Alison. I appreciate you following and commenting. I like to save up your posts and read them at once when I have an hour or so. Your posts are so detailed and incredible! Great shots!! I think a lot of street photographers will echo your thoughts exactly! The one that got away,,, just missed the shot etc, Hind sight is a wonderful thing. Keep them coming I love them. 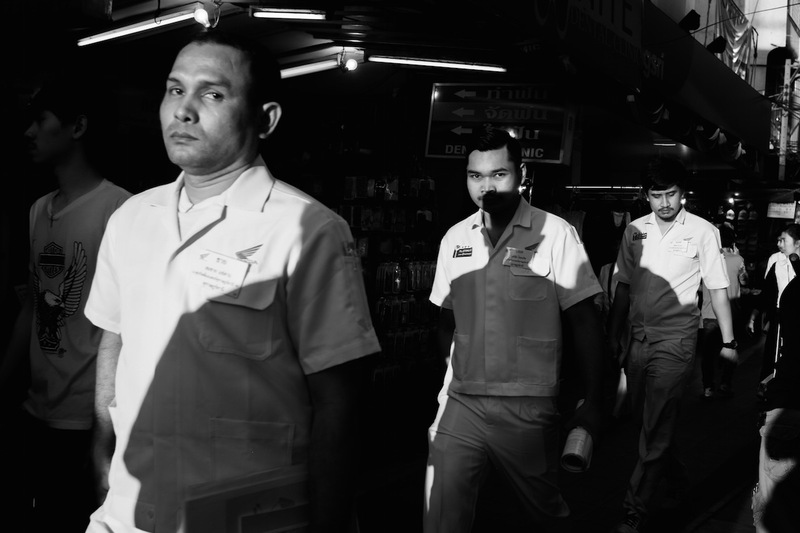 Street photography is a lot like wildlife or sports photography – there are hundreds of bad shots and near misses for every good photo! That is what makes it fun and frustrating.